Hello! Wow it’s been a long time since I posted anything… And a lot had changed. I moved house, I had a baby!! This, made in less than 10 mins. The best thing about this is that it takes only 3 ingredients and a total of maximum 10 mins prep time to make! 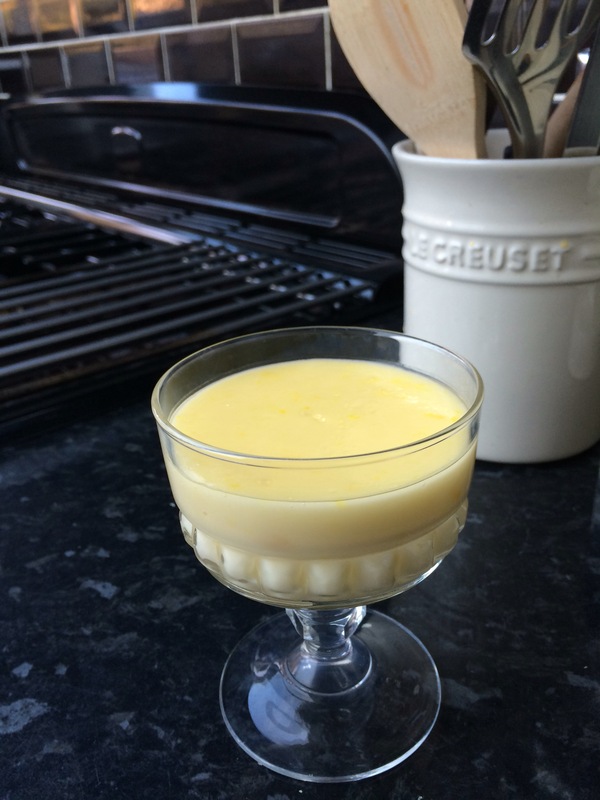 A quick and easy lemon dessert. Juice and zest the lemons, put the lemon juice to one side. Put the cream in a big saucepan, add sugar, turn on low heat until all sugar is melted. Turn the heat up and bring to a simmer for a minute. Turn off the heat, pour in the lemon juice and zest, stir well. Pour mixture into remekins or your choice of dessert holder, chill for a few hours until set. Apparently this is a healthy drink in medieval time, to be consumed warm off the stove. Hmm… I wouldn’t lie to you, after 2 weeks of constant dealing with baby sick, I’m not sure if I want to eat any warm, yellowy, sour milk like substance… I think the modern version of a chilled dessert with lots of lemon zest and a sprig of mint is more to my taste!